← DIY: Cool No-Sew Friday Night Football Shirt! 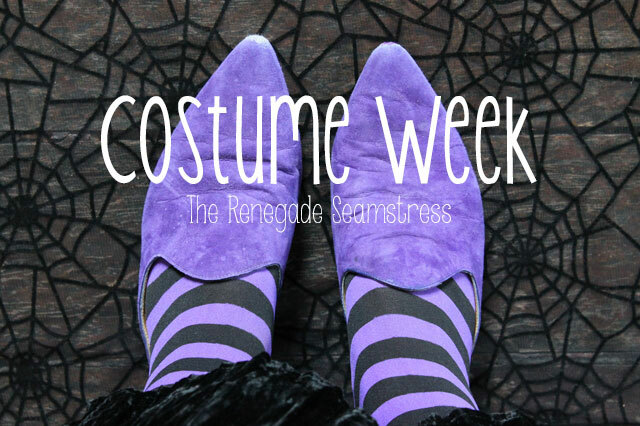 It’s costume week at The Renegade Seamstress! Whether you’ve been invited to a costume party or you’re lucky enough to be able to dress up at work, it’s never too early to be thinking of this year’s Halloween costume. Here is a week’s worth of ideas to help get you in the mood and to hopefully inspire you to put together the best costume EVER. To start out this week, if you’re feeling a bit more bad witch than good witch this Halloween season, you can put together a Wicked Witch of the West-inspired costume faster than you can call out your army of flying monkeys. And nothing says bad witch quite like a green face. You can purchase pre-made face paint or click here to find out how to make your own. To find out how to put together this iconic witch costume, grab your broom, click here and fly on over to eHow for a wickedly good time. Thanks for all of your encouragement!!!! This entry was posted in Uncategorized and tagged Costume Week, costumes, DIY, Green Face Paint, Halloween Costumes, reconstructed clothing, Refashion, Sewing, Sheriff Costume, Thrifting, Wicked Witch of the West Costume. Bookmark the permalink. I’m so happy that these projects are helpful to you, Rachel. Have a wonderful day!! !